Each year we update our 100 plus page e-book on how to write a successful business plan. With an orientation toward raising venture capital and private equity, these two documents are both for the entrepreneur and the established business executive. This is our frequently edited, free 100 plus page ebook on what it takes to write a successful business plan. This is an introduction to the reasons, format and overview of Writing The Winning Business Plan. This is an outline of what it takes to create a highly successful business planning process with details on offsite locations to ideas on facilitators, details on meeting management and a couple of Jack's favorite rules. This is a must listen to presentation gleaned from the experience of conducting hundreds and hundreds of successful meetings. 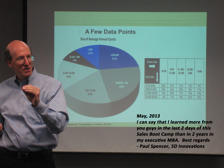 This is an overview of how to faciliate strategy and business planning offsite meetings. Want to learn more about other business tools? Contact Us Today!